Or Book Club Friday guest to day is author Nancy Bilyeau, a magazine editor who has worked on the staffs of Rolling Stone, Good Housekeeping and InStyle. 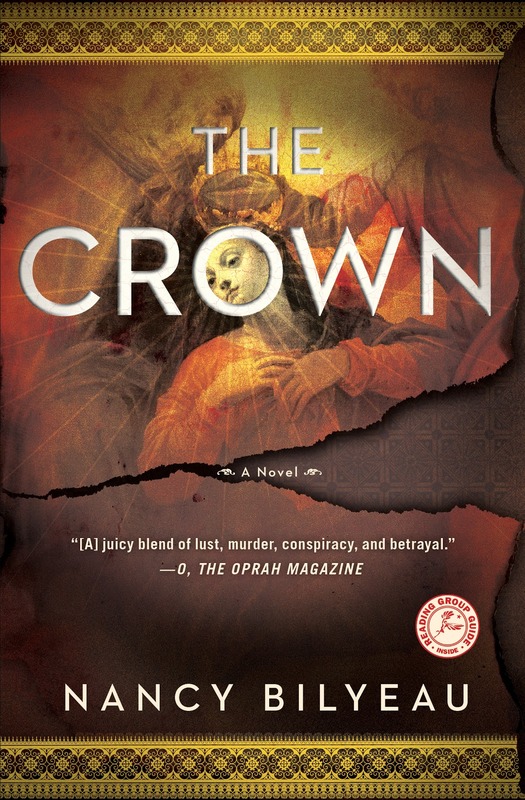 Her first novel, The Crown, was shortlisted for the Ellis Peters Historical Dagger Award in 2012. Oprah Magazine said, "Bilyeau deftly weaves extensive historical detail throughout, but the real draw of this suspenseful novel is its juicy blend of lust, murder, conspiracy, and betrayal.” The Chalice, a sequel, will be released in March. Learn more about Nancy at her website. When crafting my novel, a historical mystery thriller, I not only ignored “Write what you know,” I went about as far into an unknown world as a person can go and not be authoring science fiction. The Crown is set in England; I’m American, living in New York City. The book takes place in 1537-1538, during the reign of Henry VIII; not being a time traveler (unfortunately), I’m of the modern era. 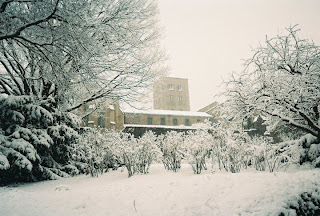 My protagonist, Joanna Stafford, is a novice in a Dominican Order; I was not raised in any religion, unless you count a few Sunday-school classes at the Unitarian-Universalist Church in Ann Arbor, Michigan. I love research and I dove into studies of Tudor personalities and daily life in Catholic monasteries. 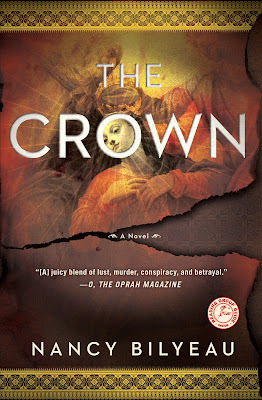 The novelist leading the fiction workshop where I developed The Crown, Rosemarie Santini, urged me to “get in the mood” to write, through listening to music or going to places that would inspire me. Music helped, no question. But finding inspiration in New York City was a bit of a challenge…until I re-visited The Cloisters, a branch of the Metropolitan Museum of Art. The Cloisters’ collection is made up of 3,000 works of art from medieval Europe, and many of its rooms are re-assembled French monasteries from the 9th to 16th centuries. To get there requires an hour and a half trip, taking two subways, but I haunted the Cloisters for quite some time (and still do). It definitely helped me get into the head of a devout young Catholic novice. But spending time in the Cloisters gave me actual ideas for important passages in my book, too--even clues. 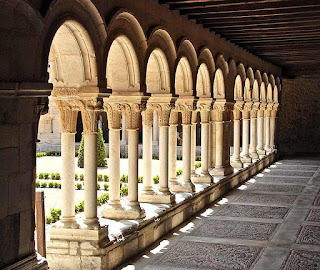 I made use of the stone chapter house, where nuns received correction from their superior; the herb-filled cloister gardens; the famous Unicorn tapestries; the tombs containing stone effigies; and the arched doorway with statues of kings on either side. Most thrilling of all, I was making my way through a lower-floor room of precious medieval objects: cups, plates, crosses, playing cards, devotional beads, silver, reliquaries, busts of saints, stained glass, candlesticks, framed miniatures, when I saw….my murder weapon. Now that was a good day at The Cloisters! This year fashion is all about glitz and glam. Many of you will be attending holiday parties in the coming weeks, and New Year’s Eve is less than five weeks away. The biggest fashion trend for parties this year is bling, bling, and more bling. You’ll be seeing a sea of sequins and gemstones decorating everything from heels to purses to clothing. However, many of these items come with astronomical price tags, and let’s face it – how often will you be wearing that pair of red rhinestone studded stilettos? Can you really afford the $800 price tag? I know I can’t. I was bemoaning my high-end fashion taste and my low-end editor’s salary with Anastasia the other day when she came up with a fabulous, inexpensive suggestion for blinging up my wardrobe. Now I’ll admit, I don’t generally troll the aisles of the local craft store. Okay. Truth? I’ve never been in a craft store. That’s Anastasia’s thing. But it turns out there are all sorts of items in craft stores that can transform the plain into the blinged-out. 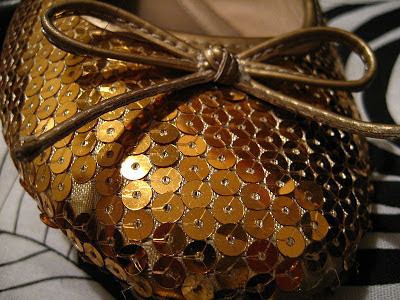 So here’s how you take an ordinary pair of shoes or purse and make them extraordinarily blingy. The first step is to rummage in your closet for an old pair of stilettos and an old clutch bag. Don’t have any? Hit the thrift store. Next, take a trip to the craft store to purchase a bag of gemstones or sequins (they come in assorted sizes and colors) and a bottle of jewelry glue. That’s all you need. That and a little time to glue all those gemstones and sequins onto your shoes and clutch bag. And instead of dropping $800 or more on a pair of shoes you’ll wear once or twice, you’ll spend about $8. You can add sequins and gemstones to clothing in much the same manner. Maybe I need to make regular visits to the craft store from now on. HEALTHY LIVING WITH JANICE - COLD OR FLU? Cold and flu season is upon us. Do you know the difference? A cold will either have no fever or be accompanied by a low fever. You may have a sore throat and a headache, and you feel tired. Colds generally come on gradually over a few days. The flu generally comes on suddenly. One moment you’re feeling fine, the next moment you feel like crap. Your body aches all over, and you run a fever of over 102 degrees. You’re extremely tired and often can’t get out of bed. If you haven’t gotten your flu shot yet, there’s no time like the present. It’s not too late. The flu shot won’t protect you from all types of flu virus, but it will offer protection from the three that scientists expect to hit this year. It’s always a gamble and a guessing game because the serum has to be made up in advance. Still, it’s a good gamble to get a flu shot. Who says you have to eat breakfast in the morning? Try a breakfast casserole for a hearty dinner. Cook the bacon until crisp. Crumble when cool enough to handle. Stet aside. Chop onion. Cook in 2 tablespoons bacon fat until caramelized. Spray a 2 qt. baking dish with cooking spray. In a large bowl combine eggs, milk, salt, and paprika. Stir in bread cubes, bacon, onion, broccoli, and cheese. Pour into baking dish. Refrigerate for at least 2 hrs. and up to 24 hrs. Preheat oven to 325 degrees. Bake covered for 20 minutes. Remove cover and bake an additional 20-30 minutes or until knife inserted in center comes out clean. Allow to stand for 10 minutes before serving. It’s that time of year again when no matter where you go, you see people decked out in holiday themed clothing. For some people, decorating themselves and their homes isn’t enough. They even decorate their cars! 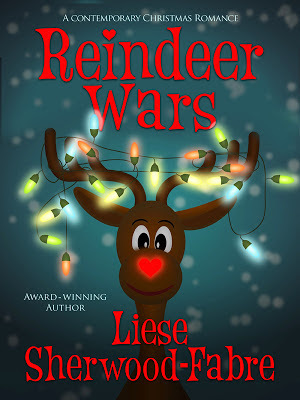 Today we have a special guest, Liese Sherwood-Fabre, author of the newly released Reindeer Wars, to tell us a little bit about the history of ugly holiday sweaters. Learn more about Liese at her website. During the 1930s, sweater makers introduced winter designs in their creations. In one catalogue ad, Janzen’s offered a green sweater with deer frolicking across the top for men and a red one with snowflakes for women. These demur images, over time, became more flamboyant and colorful, to the point of ridicule. The first time Bridget Jones meets Mark Darcy as an adult, he is wearing a “jumper” (as they call sweaters across the pond) with a huge reindeer on it. In Christmas with the Kranks, Jamie Lee Curtis proudly pulls out her Christmas vest for its annual use during the holiday season. The popularity of these “ugly Christmas sweaters” has increased with the advent of the “Ugly Christmas Sweater Party.” Three men in Vancouver, Canada are credited with the creation of the first party in 2001. The annual event grew in popularity, moving to larger and larger venues and now quickly sells out of the 1000+ tickets each year. You could win this outrageous holiday sweater! Not able to make it to Vancouver? You can hold your own party following the directions in the originators’ book Ugly Christmas Sweater Party Book: The Definitive Guide to Getting Your Ugly On. The first step in this process is, of course, to find an ugly Christmas sweater. The popularity of these items, however, has created a demand and they can be scarce this time of year. Do not fear, you can scour Craigslist, eBay, and your local thrift store for possible entries or even check on-line for stores dedicated to servicing party-goers. Another course is to make your own. Start with a simple Christmas-themed sweater and add embellishments at will. Consider extra bling, some tacky trim, and even battery-operated lights. 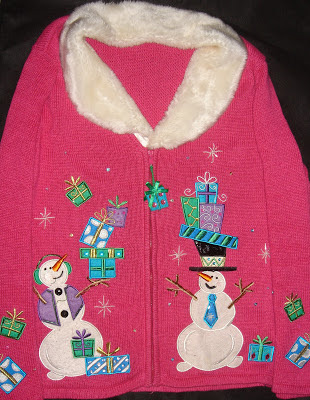 One such sweater became the basis for my Christmas novella, Reindeer Wars. 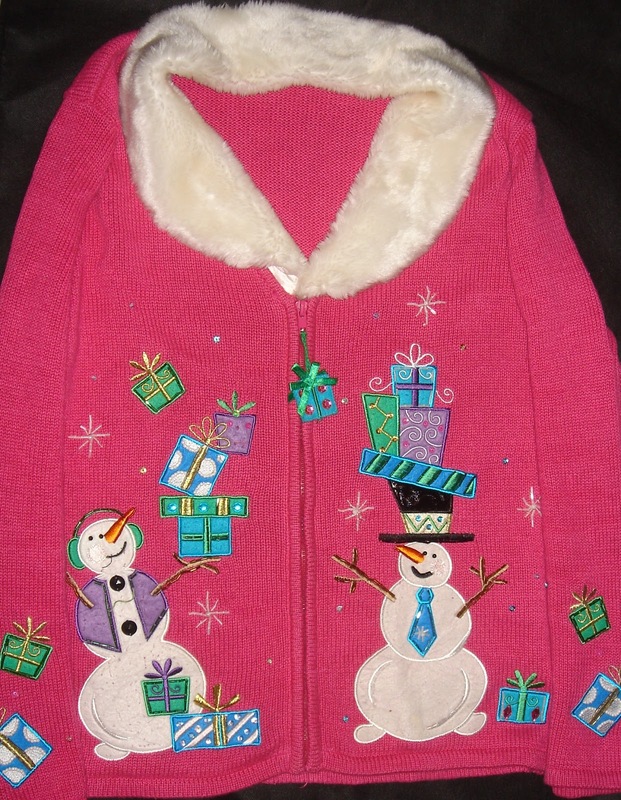 I imagined two co-workers in a bidding war for one such sweater, then meeting up at the office holiday party. I had a lot of fun designing in my mind that sweater and those others wore to the party. Little did I know that some of mine were tame compared to those I found posted on the Internet. Ever been to an “Ugly Christmas Sweater Party”? Like to participate in one? I’m holding a Virtual Outrageous Holiday Sweater Party on Facebook December 1 – 22. You’ll be able to post photos of your sweater, comment on others, and have a chance to win a prize, including an outrageous holiday sweater of your own! Join my Facebook page or newsletter for more information! Until then…. Let me know about your experiences with such a party or your sweaters for a chance to win a copy of Reindeer Wars. Blurb: Tina has a tendency to go a little overboard when decorating for the holidays, but Brian decides her skills are just what he needs to get into the Christmas spirit. Can this budding relationship survive when they find themselves in a knock-down-drag-out competition to win the office’s most outrageous holiday sweater? Thanks to all who stopped by Killer Crafts & Crafty Killers this week and special thanks to author Sharon Woods Hopkins for being our Book Club Friday guest author. Sharon offered a copy of Killerwatt to one of our readers who left a comment. The winner is Judy. Judy, Sharon will be in touch to make arrangements for getting your book to you. Our Book Club Friday guest author today is Sharon Woods Hopkins, author of the Rhetta McCarter Mystery Series. Sharon is a member of the Mystery Writers of America, Sisters in Crime, the Southeast Missouri Writers’ Guild, and the Missouri Writers’ Guild. Her short story, Death Bee Humble, appeared in the SEMO Writer’s Guild Anthology for 2012. 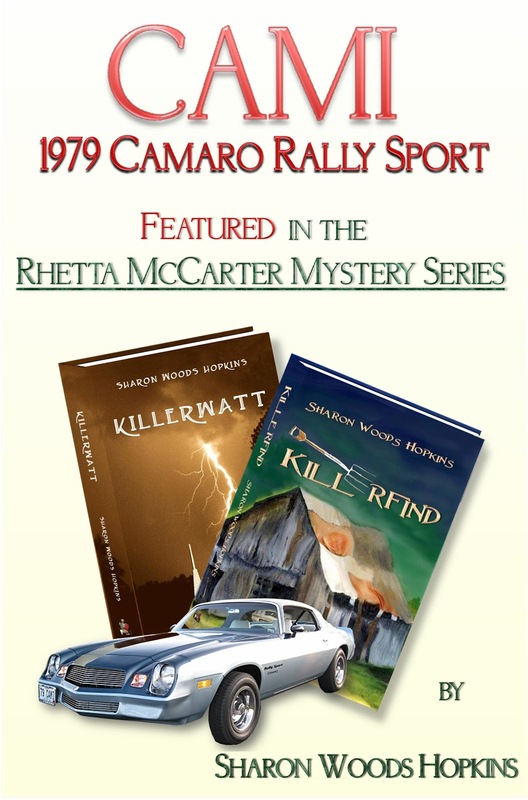 Killerwatt, her first Rhetta McCarter book, was nominated for a 2011 Lovey award for Best First Novel and was a finalist in the 2012 Indie Excellence Awards. Learn more about Sharon and her books at her website. I find it intriguing to talk to other writers and learn how they get their ideas for their books and stories. At a recent book signing event shared with several authors, the ideas ranged from, “I had the germ of this idea since I got out of diapers,” to “One day the Lord spoke to me and told me to write.” Fascinating. For me, the idea of writing fiction had been swirling around my French Canadian head (In both English and French) for a number of years. My husband Bill, who is also an author, (Courting Murder) writes prolifically. He has a head full of ideas. Me, not so much. I had always written non-fiction. I couldn’t settle on an original idea. That is, until one day at work, when something happened that propelled me into the story that became Killerwatt. My real life business is mortgage banking—not a particularly exciting field. One day following a holiday, my loan officer received a strange phone message from a Muslim customer for whom we were completing a refinance of his very elegant home in Cape Girardeau, Missouri. The gentleman had the wrong number; he was looking for the man who was teaching him how to fly a plane. (I reproduced this scene nearly verbatim in Killerwatt.) That set my mind reeling with “what if’s?” What if we had a terrorist cell right here in the Midwest? What is there to terrorize in our Ozark Mountain foothills? I began to write. I found it easy to put my protagonist in my own line of work. That saved me a lot of research. Like me, Rhetta is a mortgage banker who drives a 1979 restored Camaro with a Corvette engine, which she calls Cami. She is married to a retired judge. While we share the similarities I listed, that’s where all comparisons between me and Rhetta end. I don’t honestly think I could do what Rhetta does. Although I own the real Cami, I don’t drive her every day like Rhetta does. My series takes place in semi-rural Southeast Missouri, and surrounding areas. Murder, terrorism and mayhem can happen anywhere, if you just think about it. About Killerwatt: After one of her mortgage clients dies in a mysterious car accident, Rhetta McCarter stumbles upon evidence of a terrorist plot to wipe out the entire Midwest power grid. No one believes her—not the FBI, local law enforcement, or her husband. Rhetta convinces her assistant and loan officer Woody, a former Marine, to help her stop the attack. Problems mount, and time begins running out, leaving Rhetta alone to stop the bad guys. Can she do it? About Killerfind: When Rhetta McCarter's '79 Camaro is destroyed in a fire, she locates a perfect replacement in an old barn. There’s only one problem: the body buried beneath it. It’s getting cold outside, and that cold air is probably making its way into your house. Caulking your windows and weather-stripping exterior doors will help prevent warm air from leaking out and cold air from seeping in, not only reducing your heating bills, but making your home much more comfortable inside. But have you ever thought of using your ceiling fans in the winter? Heat rises. If you reverse your overhead fans to run clockwise on the lowest setting, the fan will push down the warm air. And that means you can push down your thermostat by a degree or two. The best Thanksgiving relish and super easy to make! Drain pineapple and oranges. Mix together cranberries and pineapple. Fold in oranges and walnuts. And that’s it! Could it get any easier? Singer Model 27 Treadle Table, Singer Manufacturing Co.
As a very young child, I used to take my dolls for seesaw rides, not on the playground but on a movable metal grate attached to a cabinet in the second floor hallway of my grandmother’s home. Years later, I learned that my makeshift seesaw was my great-grandmother’s Singer treadle sewing machine. I have a feeling I used the machine more than she ever did. Great-grandmother preferred doing things the old fashioned way -- by hand. And grandmother owned an electric version. I can imagine the circumstances by which great-grandmother came to own her machine, though. Like many families in the late 1800’s, mine probably bought their machine from Mr. Singer by paying five dollars down, half an average weekly salary in those days, and three to five dollars a month thereafter until the principal and interest were paid off. The sewing machine was the first machine to enter the American home and was seen as somewhat of a miracle when first introduced. An 1860 issue of Scientific American called it the most important invention to the world after the spinning Jenny and the plough. Godey’s Lady’s Book dubbed it “The Queen of Inventions.” The sewing machine reduced the time it took to make an average shirt from ten to fourteen hours down to a little more than an hour. Early machines were expensive, though, and even with payment plans the price was out of reach for many households. For this reason, communities and organizations often pooled their money to purchase a single machine for communal use. As sewing machine production and sales increased, the price dropped, and more families were able to afford a sewing machine of their own. By 1905 the electric powered machine was in wide use, and by 1910 there was a sewing machine in most working class homes. The sewing machine was seen as a mixed blessing, though, reflecting both the advantages and social problems of the Industrial Revolution. The advent of the sewing machine moved garment work from cottage industries into factories. By 1862, three out of four sewing machines were bought for use in factories. Because production increased, prices fell, and clothing became more affordable. However, factory workers often found themselves laboring under harsh conditions in what became known as sweat shops. Many others lost their jobs. The social upheaval created by the introduction of the sewing machine fomented unrest which eventually led to the advent of workers’ unions and the establishment of government standards in the work place. Most school text books credit Elias Howe, Jr. with the invention of the sewing machine. However, many individuals, going back to Thomas Saint in 1790, contributed to its development. 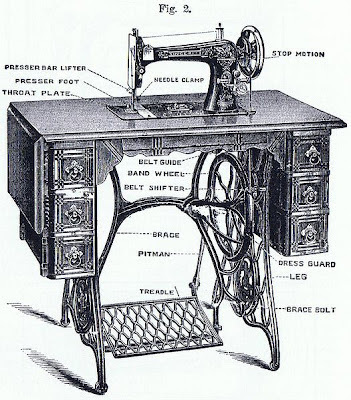 Earlier inventions had many design flaws and were never put to practical use until French tailor Barthelemy Thimmonier produced a workable machine in 1829. By 1841 eighty Thimmonier machines were producing uniforms for the French army until an angry mob of tailors, fearing the loss of their livelihood, broke into his factory and destroyed his machines. Thimmonier died penniless. At about the same time American Walter Hunt developed a practical machine but abandoned production, fearing his invention would put seamstresses out of work. Howe, who was issued a patent in 1846, found little market for his machine. In 1850 Isaac Merrit Singer developed the first practical sewing machine. Previous machines employed a hand crank to power the needle. Singer developed a treadle mechanism to replace the hand crank. Howe wound up suing Singer and others for copyright infringement. A compromise was reached whereby Howe received royalties. Singer went on to become the world’s largest manufacturer of sewing machines at the time. He was awarded twenty additional patents. In addition to establishing the installment plan for purchasing his machines, he implemented a company-wide policy of destroying trade-in machines to reduce the second-hand market. By 1876 Singer was selling twice as many sewing machines as his nearest competitor. By 1890 Singer had produced nine million sewing machines. To date, over 46,000 sewing machine patents have been awarded, including one to Helen Augusta Blanchard of Portland, Maine in 1873 for inventing the zig-zag stitch. Today there are more than 4,000 different types of sewing machines manufactured. I have no idea what happened to my great-grandmother’s treadle machine. My grandmother sold her house and moved into an apartment when I was in my mid-teens. The treadle didn’t make the move with her. But I never forgot the joy of crawling under that cabinet and taking my dolls for a ride. Years ago, I happened upon a yard sale. There on the lawn sat a Standard treadle machine. “How much?” I asked the owner. “You can have it for fifteen dollars,” he replied. Although I prefer to sew on my ultra-modern machine, for over thirty years that old treadle machine has had a place of honor in my home. Thanks to all who stopped by Killer Crafts & Crafty Killers this week and a special thank you to Michael Charton, our Book Club Friday guest author. Michael offered an e-copy of his book to one of our readers who posted a comment. The winner is Craig Faustus Buck. Craig, Michael will be in touch with you. 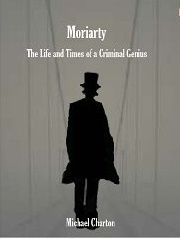 Professor Moriarty, One Writer’s Obsession. I’ve always been an Anglophile and a Sherlock Holmes fan, with a Pythonesque sense of the absurd. I was always interested in Sherlock Holmes’ main adversary Professor Moriarty. In the book The Seven Percent Solution, it was called a figment of Sherlock Holmes’ cocaine racked mind, hence the seven percent solution. I always wondered, what drove Holmes’ adversary and Holmes’ obsession with him? It would have to be a man with a similar intellect. I thought, could I make Moriarty more than just a common criminal? And then the light bulb went off. Victorian Britain, an Irish surname, Irish issues, and reading up about gangland. I had my Moriarty. I had James Moriarty shaped by the Irish Potato Famine, known in Gaelic as An Ghorta Morta (The Great Hunger). Was it a form of genocide? That is for historians to decide. My interest in history took over as well. I threw in the gangland leader brains of Meyer Lansky with the ruthlessness of the last major Irish-American gangster in the United States, Boston’s James “Whitey” Bulger. Add the history buff in me and my version of tHolmes’ opponent was created. I might enjoy the idea of a female opponent for Holmes. Travel editor Serena Brower invited author Randy Rawls here today to talk about a well-known vacation destination and home to many talented authors – South Florida. I live in South Florida. For those of you not lucky enough to be one of my neighbors, you might not grasp where South Florida is. You could be thinking it's south of an imaginary line drawn between Melbourne and Tampa, or some such. Not true. To those of us who live here, South Florida consists of the three most southern counties on the peninsula, Atlantic side—Palm Beach, Broward, and Miami-Dade. We call it South Florida. Others can label it whatever they want. As you read this, you're probably picturing some of those scary headlines about hurricanes. Yeah, South Florida gets hurricanes—infrequently. I've lived here since 1998, 14 years. We've had one hurricane during that time, Hurricane Wilma in 2005. And on a scale of 1 to 10, it was about a 2. Pretty weak. Yeah, it took off some roof tiles, blew over some trees, and, of course, knocked out power for anything from a couple of days to a couple of weeks. But, heck, everyone here knows Florida Power and Light can't maintain power on a clear day, much less when the wind blows. Don't get me wrong, though. When you can't go to the market or the gas station and you're trapped in a dark house with no air conditioning, it's no fun. But we don't have horrendous tornados, or dust storms, or earthquakes, or blizzards. In fact, we don't have more than a week's worth of cold nights a year. I call it paradise, and I love it here. However, South Florida is also a state of mind. We have a saying. There is no fiction in South Florida. No matter what you write, it happened yesterday, is happening today, or will happen tomorrow. I am a firm believer in that adage. I mean, where else can you have real news stories about body parts being found in suitcases scattered along the Interstate? It has happened here—more than once. If you happen to be near South Florida, I'll have my book launch for Hot Rocks at 7 p.m. on November 30th at Murder on the Beach Mystery Bookstore, 273 Pineapple Grove Way, Delray Beach, FL 33444, (561) 279-7790. Come on in for hors d'oeuvres, wine, beer (Killian's Red Lager, of course), and me. 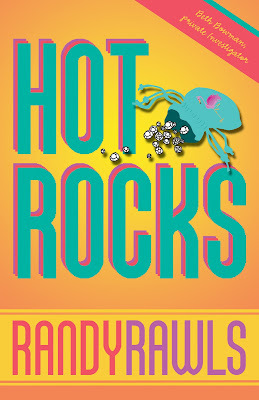 If you're not near us, order a copy of Hot Rocks at www.murderonthebeach.com. 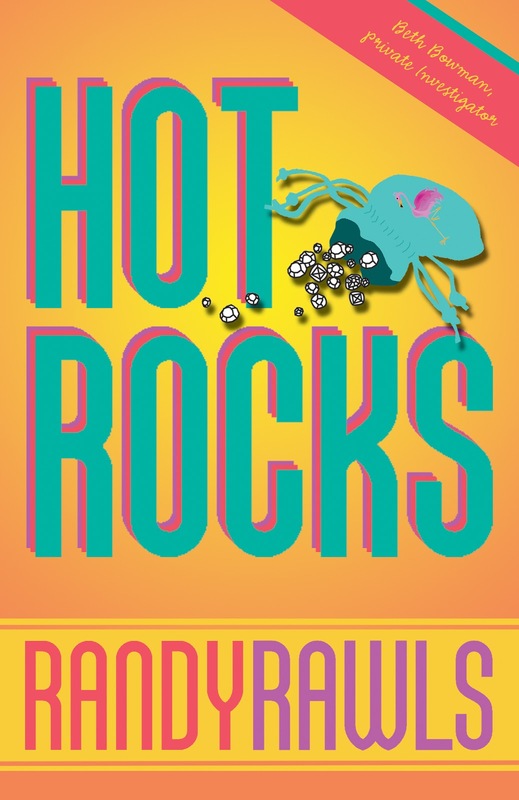 Hot Rocks is Randy's latest novel, a South Florida mystery featuring PI Beth Bowman. Beth takes on a simple case, but soon discovers that things are not as they seem. A husband is not a husband. A wife is not a wife. A homeless man is not . . . Yet, one thing is real. Someone wants Beth dead. Last week I talked about how applying color to a ceiling can make a small room appear larger. Here are five more tips for creating the illusion of a larger room. 1. Place a large mirror on the wall opposite a window. The mirror will both reflect light and create an illusion of a more spacious room. 2. If you live in an older house where doors separate halls, living room, dining room, and kitchen, remove the doors. This will create more of an open concept feel without the expense of tearing down walls. 3. Mounting curtain rods close to the ceiling will make ceilings feel higher and windows taller. 4. If you have a small dining room or eat-in kitchen space, use a glass-top table to make the room appear larger and less broken up with furniture. 5. Vertical patterns draw the eye upward. Try papering an accent wall in a vertical striped paper or paint vertical stripes on the wall. Using the same color paint but alternating a matte and semi-gloss finish will create a subtler effect but still create the illusion of height. Don’t want to bother with the mess of stuffing a turkey but don’t want to serve boxed stuffing? Try pumpkin bread pudding this Thanksgiving. Sauté the onions and garlic in the butter until golden brown. Set aside to cool. Mix together pumpkin and milk. Beat eggs and sugar. Add cinnamon, nutmeg, and cloves. Combine sautéed onion/garlic mixture, egg mixture, and pumpkin mixture. Place bread in large bowl. Pour pumpkin mixture over bread. Add walnuts. Mix well. Pour into greased baking dish. Bake at 350 degrees 30-45 minutes until mixture sets. Make a series of these to run down the middle of a dining room table for a unique centerpiece. Choose colors to coordinate with your decor or for each holiday. The sample was made from a 9.5 oz. coffee drink bottle, but you can use any size or shape bottle. 1. Clean glass with alcohol. 3. Apply decoupage medium to back of fabric square and adhere to glass. Smooth out any wrinkles and bubbles with fingers. Continue applying fabric randomly, overlapping slightly, until entire surface is covered. Be sure to wrap fabric around to inside of bottle and bottom edge. Allow decoupage medium to dry. 4. Apply a coat of decoupage medium over entire surface of bottle. 5. Tie raffia around bottle neck. Thanks to all who stopped Killer Crafts & Crafty Killers this week and a special thank you to Elaine Joyce, our Book Club Friday guest author. Elaine offered an e-copy of The Pink Lady to one of our readers who left a comment. The winner is Kelly Boyer Sagert. Congratulations, Kelly! Elaine will be in touch with you. Our Book Club Friday guest today is Elaine Charton who writes under her own name and as Elaine Joyce. For as long as she can remember Elaine has had a book in her hands. She should have realized it would only be a matter of time before she began writing her own stories. Elaine is married to a writer who will be our guest next week. To read more about her, visit her Elaine Joyce blog or her Elaine Charton blog. with a happily-ever-after where the strong man and the strong woman meet, fall in love, and live happily-ever-after. Just one thing, dead bodies kept showing up. I may be a little slow sometimes, but eventually I figured out the universe was trying to tell me something. All authors have stories about where they get their ideas. My current book, The Pink Lady has one of the most unusual ones, in my opinion. The Pink Lady is written by my evil twin, Eaine Joyce. It started on a Saturday afternoon shopping with my sister-in-law. We were browsing in a department store and came upon what had to be one of the most gorgeous beds ever created. It was large and hand-carved out of what could have been oak. My fingers itch to touch the intricate carvings all over the bed. The headboard showed small drawers perfect for hiding things. Then I saw the price tag, and the two of us almost fainted dead away. There was no way I could afford that bed, then or now. However, I could not get it out of my mind. I knew it would end up in a book; I just didn't realize it would be so soon. A few days later, I was sitting at work, and I hear this voice. You know the one. Every writer has one. This one kept saying, "She's in my bed!" and showing me a picture of a ghost dressed like a flapper, floating in the air over the bed. Okay, Mr. Charton didn't marry a dummy. I grabbed some paper and wrote some notes. Good thing I was at lunch. That weekend my critique group and I did some brainstorming and The Pink Lady was born. I am hoping this is the first of many in a series. If any of you are old enough to remember the movie Topper, you'll get an idea of my ghosts Reggie and Leticia Farnsworth. The Pink Lady is a venerable Victorian home located near Cape Cod, Massachusetts. It is the first in a series of mysteries set in and around the house and its residents. Anna Murray inherits the home from her uncle and decides to turn it into a bed and breakfast with the help of the two resident ghosts, Reggie and Leticia Farnsworth, and BJ Kent, a contractor who specializes in Victorian restorations. As Anna and BJ peel back the layers of grime, the layers of time reveal the truth behind Reggie and Leticia’s gruesome murder. Anna and BJ’s situation parallels the Farnsworth's, and they rush to solve the mystery before it reaches the same sinister conclusions. The Pink Lady is available for download on your Kindle right now. Soon it will be available in other formats as well as POD. Last week Tessa had a great fashion tip regarding static cling. Her solution? The common safety pin. Today’s tip also features safety pins. Whether you’re traveling abroad or just spending the day at a fall bazaar, you need to make sure you’re not an easy mark for pickpockets. These thieves are devious. They’ve mastered the art of removing your valuables without you even realizing you’ve been victimized until they're long gone. The easiest way to deter pickpockets is to make sure they can’t dip their hands into your pockets or your tote bag. And the easiest way to do that is to use safety pins to secure your pockets and tote bag whenever you’re in crowded places.